Didot 3 – At long last, I’ve found it! There's a particular electronic song that’s so invigorating that it just keeps popping into my head every so often, at random, without warning or prompting. The problem is that I’ve never quite been able remember what song it is, or who performed it. I can hear it note for note, but every time I think i've come close to identifying it, it slips away. I've long suspected that it was e*vax or esem, but a exhaustive searching of the library failed to reveal it. But, this morning, out of nowhere, voila! comes that same pulsing, driving beat, over-lapped with the dirtiest grinding wahwah flange that I’ve been search for. 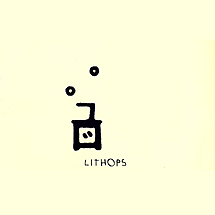 Suddenly pounding my ears was Didot 3, the third song on the album Didot, by Lithops, aka Jan Werner who is one half of the one of the few bands whose t-shirt I’m still willing to wear Mouse on Mars. At last, this particular tunequest is over! This album is very hard to come by. So if you find it, get it.